Area: 307 sq km.Location: The northern boundary of the Tantalus Range is Pokosha Creek and the Ashlu River. The eastern boundary is the Squamish River. The southern boundary is Howe Sound and Mill Creek, which separate the Tantalus Range from the peaks around Mount Sedgwick. Finally, the western boundary is the Clowhom River. Terrain: The heavily glaciated faces of the Tantalus Range are prominent from the Whistler Highway (Highway 99) as one drives north of Squamish. The mountains are very rugged, and draped with glaciers. Climbs usually involve a steep and bushy climb from almost sea level, and then either steep glacier work or a rock climb to get to the summit. The solid granite and the proximity to Vancouver makes the peaks particularily attractive for rock climbing. There are several approaches to the area, the most common being across Squamish River via canoe to Lake Lovely Water Trail or by 2WD road to the Sigurd Trail further north. Aircraft are chartered by fly-in parties to Lake Lovely Water. The range is largely intrusive rock composed of quartz diorite and granodiorite of the Cenozoic-Mesozoic Coast Plutonic Complex. An area of high mineralization potential exists on the western edge of the range, and outside of the park. The mineralization arises from a slender, elongate, NW-trending pendant of metavolcanic and metasedimentary rocks (conglomerate, greywacke, siltstone, argillite, rhyolite) which extends from W of Lake Lovely Water near Red Tusk to the Ashlu shear zone near Falk Creek and is more bulbous near its end points, tapering in the middle, W of Ossa Mountain. Ossa Mountain and Pelion Mountain are part of a large lobe of diorite and gabbro which butts up against the pendant. 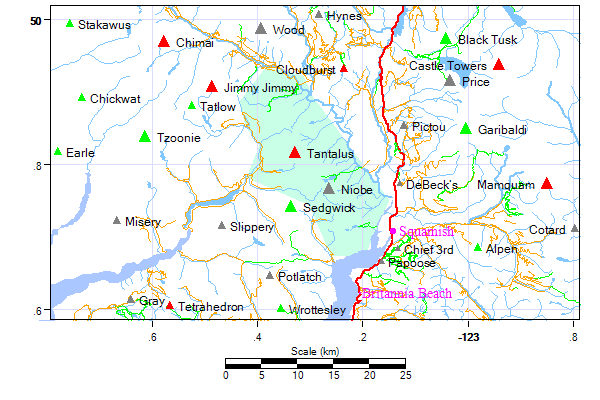 SW of Fries Creek, Mounts Conybeare, Murchison and Sedgwick are predominately diorite, gabbro and diabase, while SE of Murchison is leucogranite with a small outcrop of pyroclastics near the mouth of the Squamish River at Touch-and-Go Towers. History: The name "Tantalus" comes from Greek Legend. For various crimes he was banished to the underworld (Hades) where he spent his days up to his neck in water with delicious fruits hanging over his head which were wafted away whenever he tried to grasp them - hence the word "tantalize". According to Neil Carter the Tantalus Range got its name because climbers were "tantalized" by the sight of such spectacular peaks, just out of reach across the swirling green waters of the Squamish River. Another version of the myth describes Tantalus' doom as sitting at a loaded banquet table, chained to his seat and unable to indulge; his whole family were doomed with him. Their names, especially his daughters Niobe and Dione, comprise most of the rest of the range, the image being that of a family frozen in front of a feast they cannot eat. Mount Pelops is named for his son, who escaped the curse (the gods had brought him back to life after his father sacrificed him, then punished his father), only to have his own divine misadventures afterwards, incurring the wrath of Hephaestus. He was king of Achaea, Elis and Arcadia, which are on the peninsula which bears his name (the Peloponnese). The highest peak in the range, Mount Tantalus, was first climbed in 1911 by a team led by Basil Darling, and including Allan Morkill and Stanley Davies. In 1914, basil and Morkill returned to climb Alpha, Serratus, Lydia, and the Red Tusk. Tom Fyles, probably the best coast mountaineer of that era, had keen interest in the range. In 1916, he made first ascents of Omega, Pelops, and Dione, as well as the second ascent of Tantalus and put up a new route on Serratus.